SAMS nurse taking blood pressure reading of CCCU member. 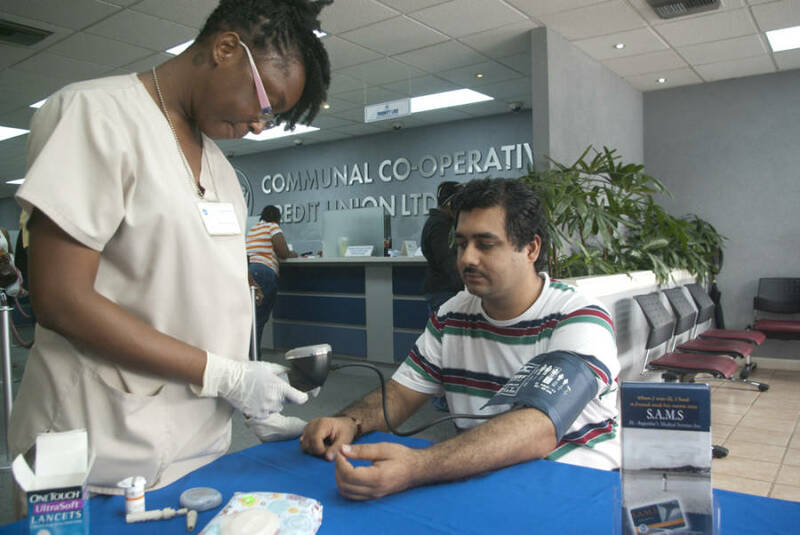 St. Augustine Medical Services Inc. (SAMS), recently held a mini health fair at the head office of the Communal Cooperative Credit Union (CCCU) on Halifax Street, on 27–28 March. In addition to health screening, SAMS also offered discounts to members who signed up for their MEDICARE initiative, which offers inpatient/outpatient medical services up to a maximum of EC $6,000 per year. SAMS is in the process of acquiring a Hyperbaric Chamber which is critical in treating dive-related injuries and is also used for treating varying levels of burn injuries. This will be a significant milestone for Grenada’s general health care offering for our nation, and for those visiting Grenada as a dive destination. “It is often said that ‘the health of a nation is the wealth of a nation’, but what does it all mean? Several international medical studies have proven that health improvements provide a significant boost to economic growth. And, like education, it is a fundamental component of investing in the human capital for any country,” Amechi noted. SAMS was founded in 1998 specifically as an inpatient centre which offers comprehensive care in over sixteen areas of combined clinical and surgical services from general consultation and maternity, to neurology.